METUCHEN, NJ--(BUSINESS WIRE)--Jan. 23, 2018-- Regency Centers Corporation (“Regency” or the “Company”), a national owner, operator, and developer of grocery-anchored shopping centers, has announced the acquisition of The District at Metuchen, in Metuchen, New Jersey. This 66,000-square foot center is anchored by Whole Foods Market and located in the vibrant downtown of the trade area. It lies less than two miles from the I-287 and I-95 interchange; two of the major arteries of the metro New York market. Neighboring the site is the Metuchen station and the Metropark station, servicing a combined 11,000 commuters each weekday. 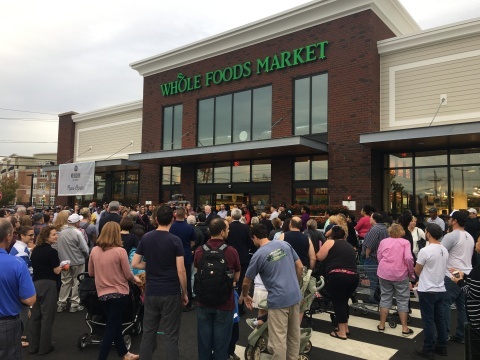 Whole Foods Market celebrated their grand opening last October, which houses Comida Fresca; a fresh, modern Mexican restaurant with indoor and outdoor seating. Other tenants include European Wax, Title Boxing, and Chipotle. For leasing inquiries, please contact David Sherin at DavidSherin@regencycenters.com, or 610-747-1212.